Location: Black Lake, Torrance, Muskoka, Ontario. 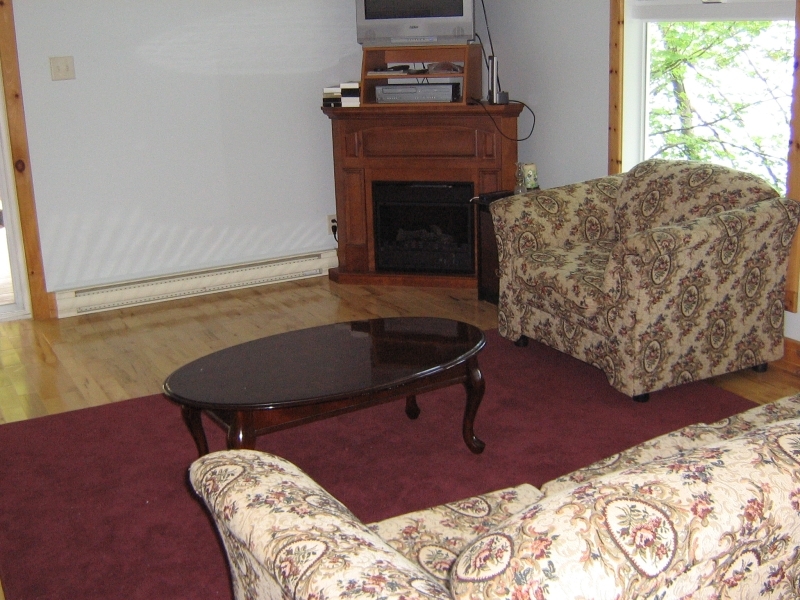 If your family is searching for a comfortable, newly built, all-season, lakefront cottage that is easily accessed by a paved road, close to the amenities of the towns of Gravenhurst and Bala, and is central to the many activities that Muskoka has to offer, this may be the cottage for you. 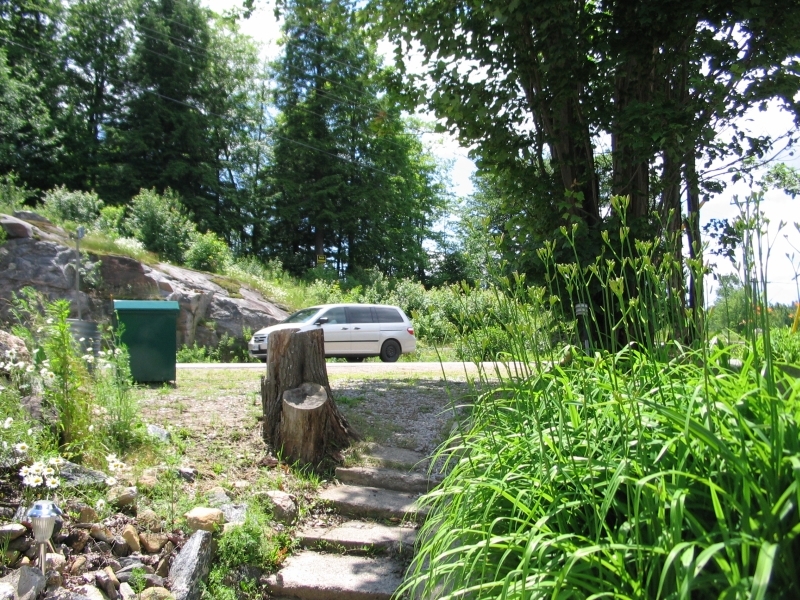 Latchman Cottage is located just off Highway 169 in the small community of Torrance, just five minutes drive from Bala, and about fifteen minutes drive from Gravenhurst. 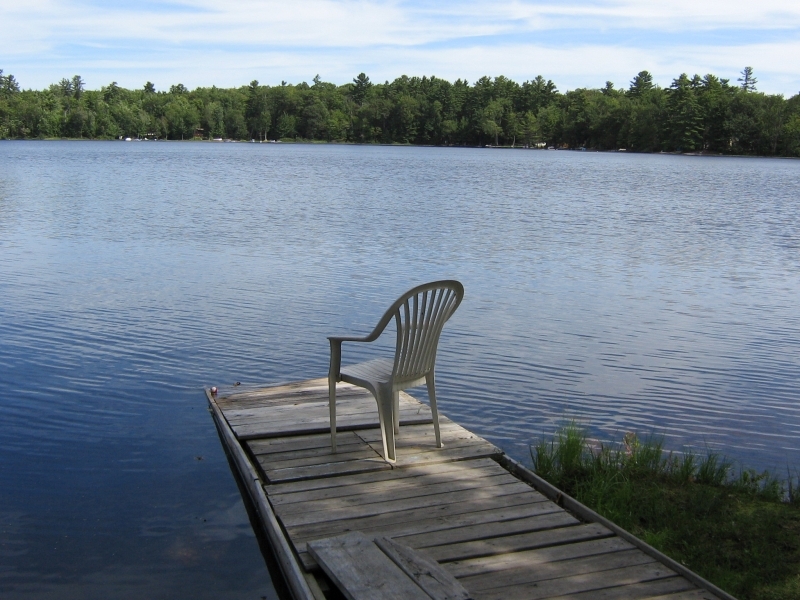 It is nestled on the shore of Black Lake, which offers boating and fishing opportunities. 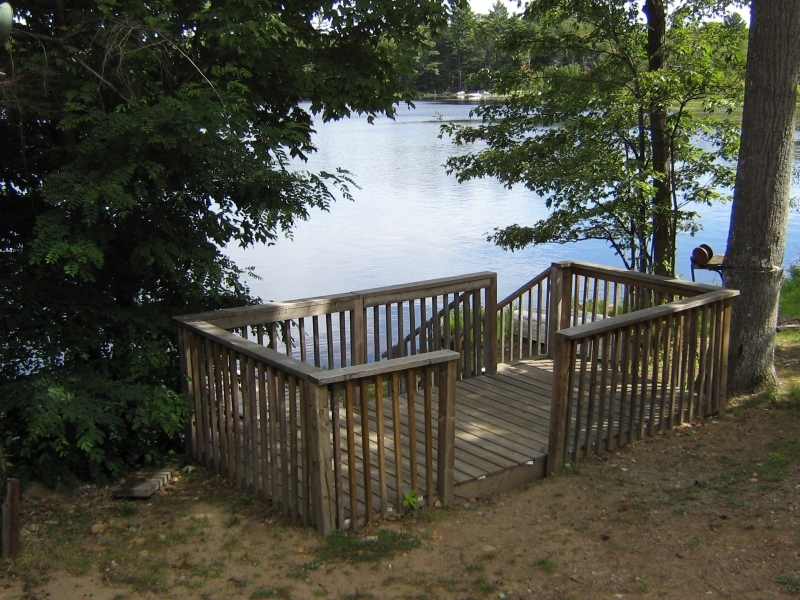 A few easy steps down to the waterfront lead to a dock that provides a place to sit and enjoy the lakefront view. The lake bottom is shallow, with a soft sand, silt bottom and some weeds. 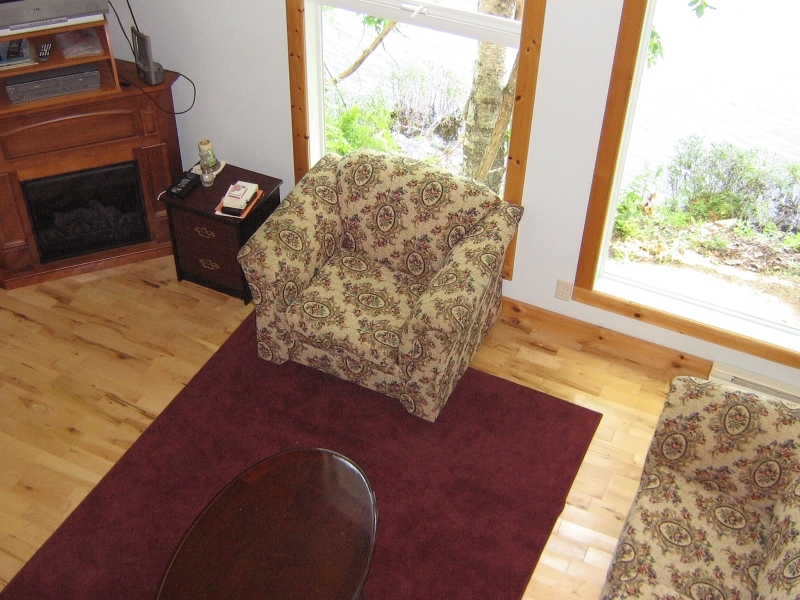 The cottage offers a choice of outdoor seating. 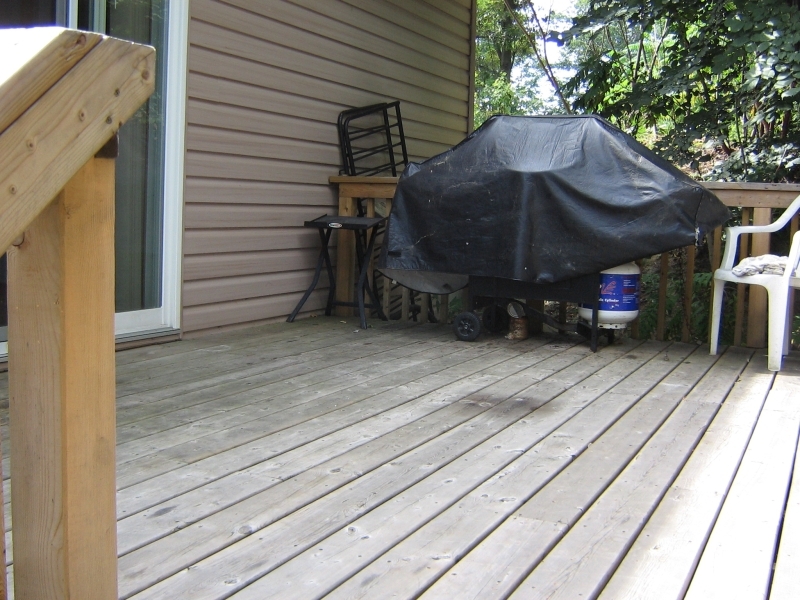 A small deck faces south to catch the sunlight, while a second, more private deck faces north and is accessed from the living area. Here there is a barbeque and lawn furniture, and trees provide shade. 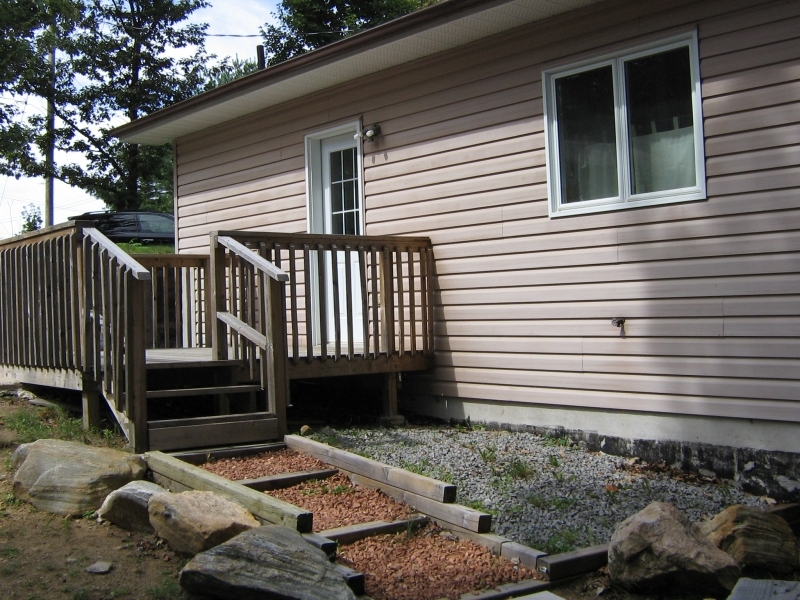 The cottage is easily accessed from a short level driveway off the highway. 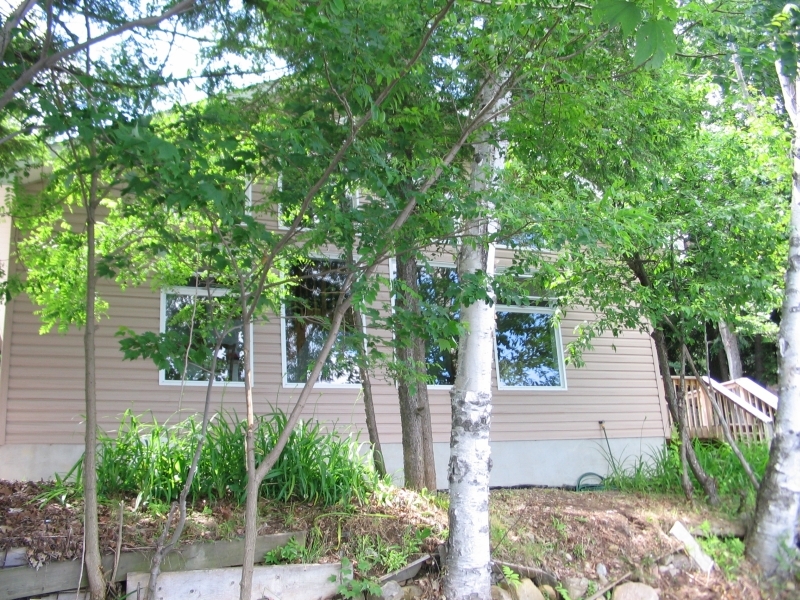 The entrance off a small deck leads into the main level, where there is a kitchen that opens into the living area, two bedrooms and a four-piece bathroom. 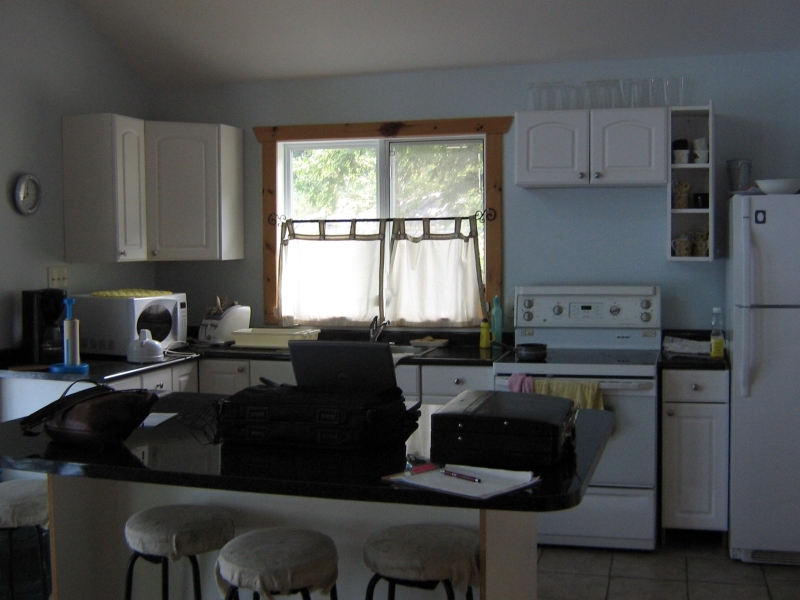 A kitchen island provides the seating area for eight to dine, and the cottage is equipped with a full-size stove, refrigerator, microwave, and coffee maker. The living area with its cathedral ceilings has seating for six on a couch and love seat. Wonderfully large windows face the water and offer a great view of the lake. For those chilly times or romantic moments there is an electric fireplace. One bedroom runs off the living area, and one off the entranceway. 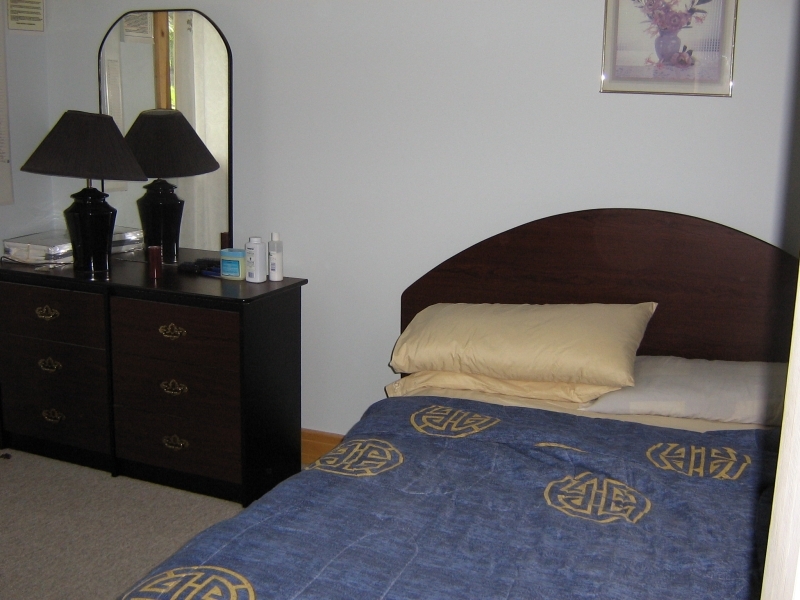 The front room has a queen size bed and the other a double bed. A steep staircase rises from the living area to a loft area with a double bed. 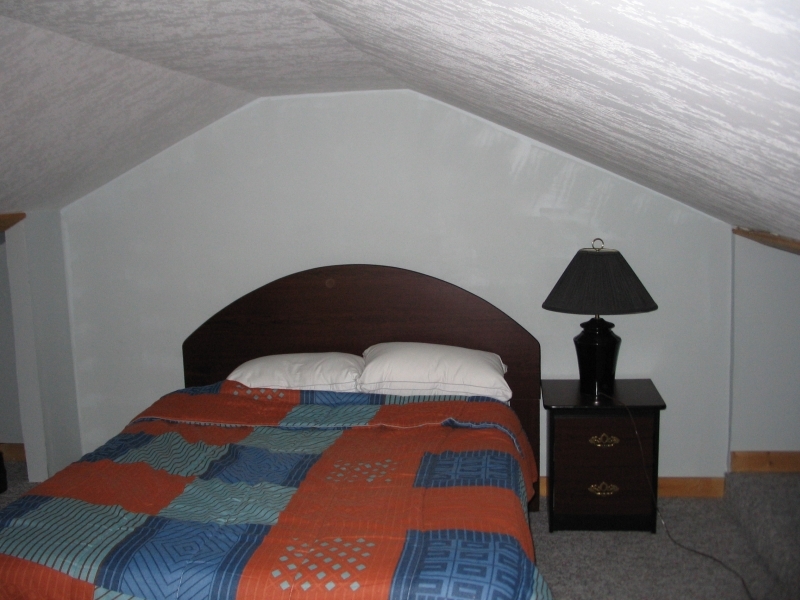 The five-foot high loft area is suitable for older children or adults to sleep. It is not safe for small children because of the steepness of the stairs. Close by the cottage is Torrance Barrens Park with its picturesque hiking trails, wonderful views and famous dark skies. Latchman Cottage is a few minutes drive to the lovely town of Bala, where you can find scones and chelsea buns at Don’s Bakery. Explore the Bala Museum, which features Lucy Maud Montgomery (who vacationed in Bala in 1922), famous for Anne of Green Gables. Bala is home to the annual October Cranberry Festival, or take a free self-guided tour of the cranberry marsh anytime, year round. Dance the night away at The Kee To Bala, operating since 1942. For the sports enthusiast, there are numerous area golf courses. Gravenhurst, a fifteen minute drive from the cottage, features the new Muskoka Wharf, home to Grace and Speed, the antique and classic boat museum at the Muskoka Boat and Heritage Centre. The famous steamship “Segwun” (built in 1887) and its sister ship “Wenonah ll” cruise Lake Muskoka from the Gravenhurst wharf during the summer. The Gravenhurst Opera House has live theatre, and the town has interesting shops. Algonquin Provincial Park is approximately an hour and a half drive, with all that it has to offer in hiking, camping, canoeing and nature activities. 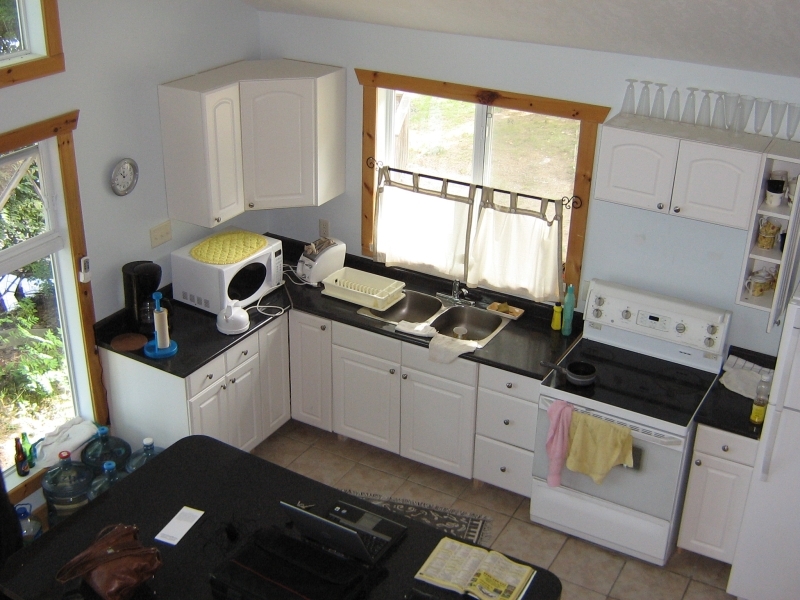 Refrigerator, stove, microwave, coffee-maker with filters, place setting for eight. Please bring your own drinking water. Please bring your own sheets, pillow cases and towels. Two decks, picnic table, lawn chairs, propane BBQ. Grassy approach, shallow for a long way out, sand/silt bottom with some weeds. 25 minutes from South Muskoka, Bracebridge. $895 per week during off-season. 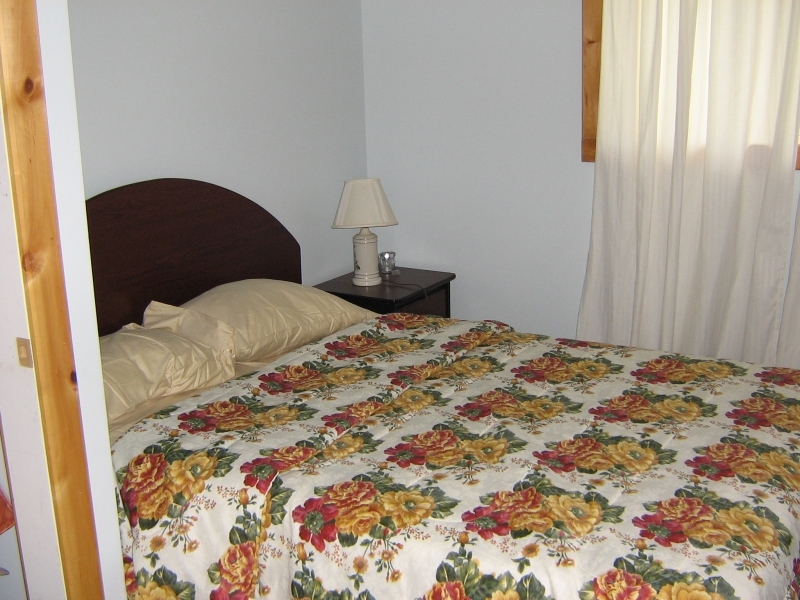 $230 per night during holiday weekends in off-season (minimum 3 nights). $600 refundable security deposit required. For stays 1 week or less: $59 Accidental Damage Insurance required. For stays longer than 1 week: $75 Accidental Damage Insurance required. To book this cottage, please fill out the online form. 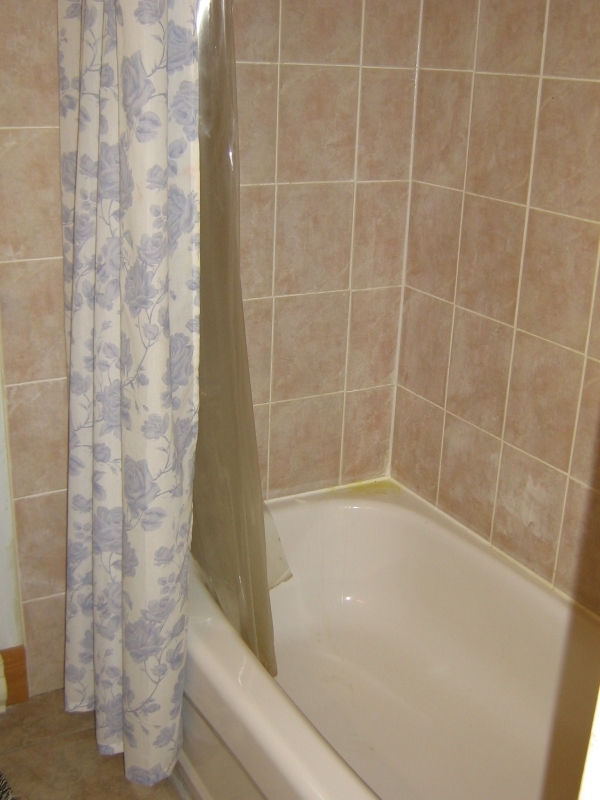 Alternatively, you can fill out our printable application formand email it to reservations (@)ontariocottagerentals (dot)com or fax it to 705-788-3728. We will contact you regarding availability once the application form has been received.